Looking for a close-knit community with school spirit, trust, and solid relationships, Morgan Rohr was looking for a school that had each other’s backs. She found all of that at Woodland Regional High School. Rohr came to Woodland from Explorations Charter School and so far, is excited about meeting so many new students and accepting the difficulties that come with starting over in a new school and building relationships. Rohr is ready to create a bond with her students and start a good reputation here at Woodland. Since Woodland has 80 minute blocks and alternating A and B days, Rohr says her first week adjusting was a bit of a shock; however, she is preferring the longer periods. One struggle she is facing is having to move classrooms throughout the day and have everything prepared in five minutes. Time management is a common struggle as it can be difficult to figure out when moving to a new school for both teachers and students, but sometimes the students can make it seem easier. 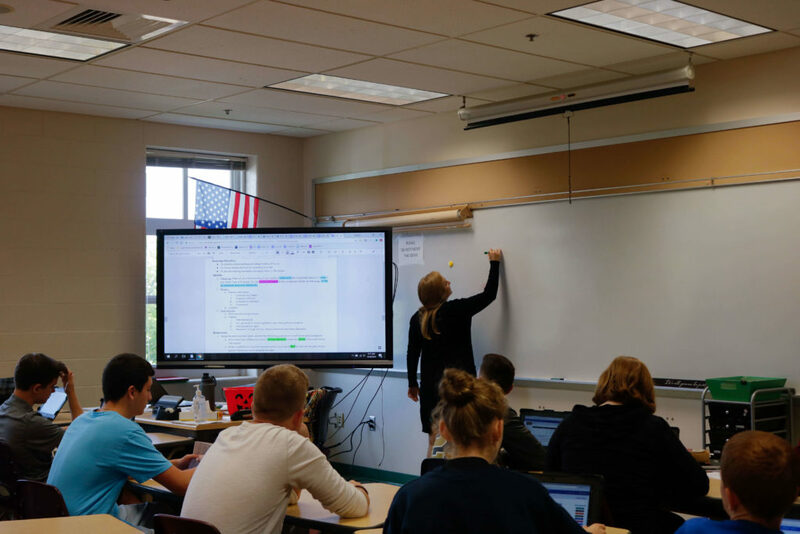 Rohr loves teaching English and how it can help students in a lot of different ways, but the advisory is where she is hoping to make connections. Advisory is important to a lot of students and Rohr wants to make it the best time for her students every day. And with goals like that, Rohr hopes to establish a reputation as a teacher who builds trust and offers support here at Woodland.